Ahmed Hussen Canadian Immigration Minister has announced 500 additional spaces in the A.I.P. for the present year. This measure is in response to the increasing success of the program, which aims to enhance the immigration of skilled workers in the Atlantic region. Writing on Twitter he expressed his happiness in announcing the increase for keeping up with demand. Subsequently after the increase, the A.I.P. at present has a yearly allocation of 2,500 spaces, for fresh immigrants. These will be spread across Prince Edward Island, Nova Scotia, New Brunswick and Newfoundland & Labrador. This increase follows 1,800 skilled workers and international graduates, who received an endorsement for the program in 2018, and the annual target was 2,000. The Pilot contains programs for high-skilled, intermediate-skilled workers, and also international graduates. 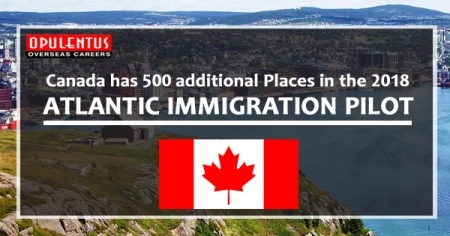 These programs cater specifically for immigrants, who intend to permanently settle in Prince Edward Island, Nova Scotia, New Brunswick and Newfoundland & Labrador. Furthermore, it had a slow start, after it commenced in 2017. Moreover, in the Federal Plan there was an allocation of 1,000 for the program in 2018. Its rising success ensures that more than double the predicted number will now arrive in these areas. Officials hope that the program will welcome 4,000 fresh immigrants annually by 2020. This program provides extensive assistance to the participating provinces. They presently have an aging population, and as a result, a shrinking labor force. The Immigration Levels Plan For The A.I.P. By using the A.I.P., many employers can bring in skilled workers and international graduates for filling up specific positions. Consecutively, such candidates get help to integrate by drawing up of a Settlement Plan. Every person arriving in the program, has to receive an endorsement by the provinces. The reason of this measure is to ensure that candidates for the A.I.P. are retained by the provinces they arrive in. Retention is a big challenge for Atlantic Canada, because immigrants, frequently move through provincial programs, but decide to settle in other places. Skilled Workers, need to have previous work experience, for a year corresponding to 1,560 hours or 30 hours in a week in the past three years. This can be non-continuous, full-time, or part-time, but must add up to 1,560 hours. In one occupation, but the authorities, permit working with different employers. Carry a salary- Please note that voluntary or unpaid internships are not counted. In the Atlantic High-Skilled Program, candidates need one year experience at skill type/level 0, A, or B. In the Atlantic Intermediate-Skilled Program, candidates need an year of experience of the skill level C.
This experience can be gained inside/outside Canada. No work experience is necessary for these Candidates. Candidates also need an Educational Credential Assessment to ensure that it is valid and commensurate to a credential in Canada. The E.C.A. must confirm that the education is equal to a completed Canadian high school or Post-Secondary Certificate, degree or diploma. This E.C.A. needs to be less than five years old at the time of applying. Had a visa/permit for working, studying or training in Canada. A candidate must have a needs assessment before immigrating. After the assessment, a candidate will get a plan with information about the community they are moving to and where they can get help after arrival. Employers need to complete an Endorsement Application for every candidate who is filling an existing vacancy. Candidates cannot apply to I.R.C.C. unless they have an endorsement which includes data regarding the Job Offer and Settlement Plan.